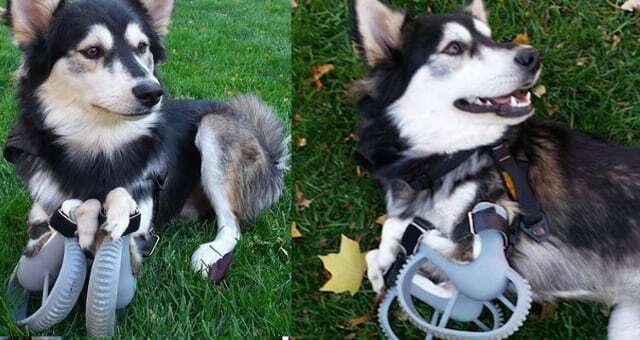 Can a DIY approach to pet prosthetics be around the corner? 3-D printed materials are less durable. Standard artificial limbs are made with ultra durable polypropylene plastics and carbon fiber material. Kaufmann explains that current materials used in the 3-D printing process cannot match the durability, strength, and diversity of modern prosthetics. Since most prosthetics need to have the possibility of shape modification after the first fit, they must be made with pliable but durable materials that can be modified to perfection – something that isn’t currently possible with 3-D printed materials. He explains that if a 3-D printed prosthetic doesn’t fit, a new one must be printed, thus driving up costs and time. 3-D printing is time consuming and costly. “3-D printing takes extraordinarily longer to fabricate a simple part when compared to traditional fabrication techniques,” Kaufmann says. “Standard fabrication techniques can take up to two hours to complete. A 3-D printer can take upwards of 12 to 16 hours to print one part.” This makes it cost-prohibitive for the average pet prosthetic buyer. Additionally, only when an artificial limb is worn for the first time will a prosthetist know if it works safely, comfortably, and biomechanically appropriate – if the fit is wrong, costs escalate even higher. “A single part with only prototype-grade material in 3-D printing could run upwards of $700 to $800,” adds Kaufmann. “To accomplish the same type of printing with material that only slightly resembles the strengths and qualities of polypropylene prosthetics will cost upwards of several thousand dollars.” This is based on the cost of an advanced industrial 3-D printer, he explains. Kaufmann and happy Tripawd patient. Not enough vet experts are applying the technology. 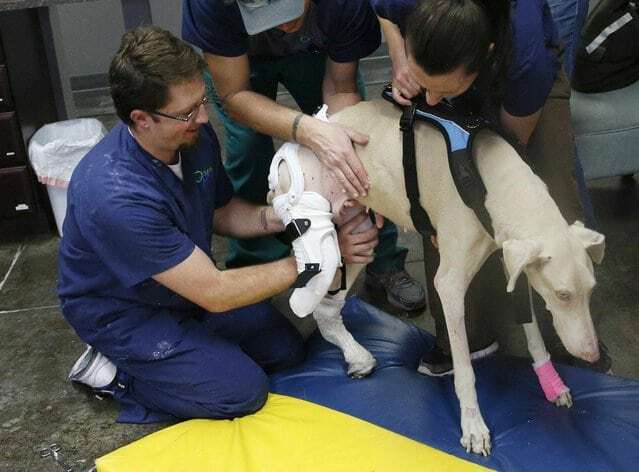 Without extensive studies in animal biomechanics and veterinary science, a well-intentioned techie can inadvertently do more harm than good when creating artificial limbs for animals. The creator must have an intimate understanding of animal biomechanics in order to create a prosthesis that works safety and comfortably without causing harm and injury. 3-D printing will certainly evolve into exciting possibilities nobody ever imagined. But for now, the average pet parent who wants a 3-D prosthetic or orthotic device for their handicapped pet should first understand that the difference between advanced computer aided prosthetic design and 3-D printing is the quality, strength, and durability of the materials. Parents must proceed with caution, or stick to current production processes developed by the experts like OrthoPets. OrthoPets talks about prosthetics and braces for three-legged dogs and cats. 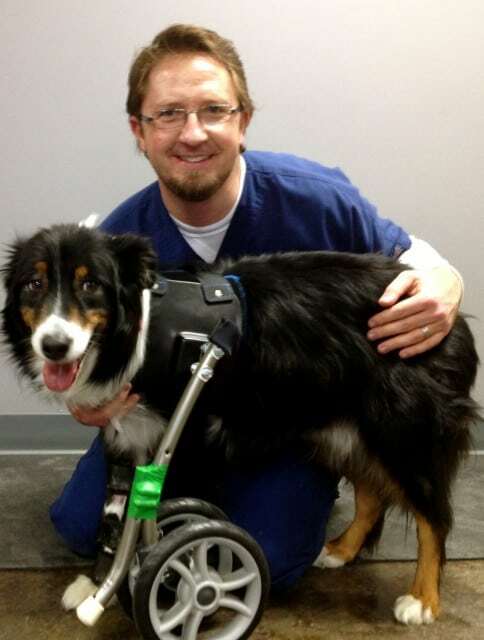 All Tripawds News posts about prosthetics, braces and orthopedics for amputee pets. 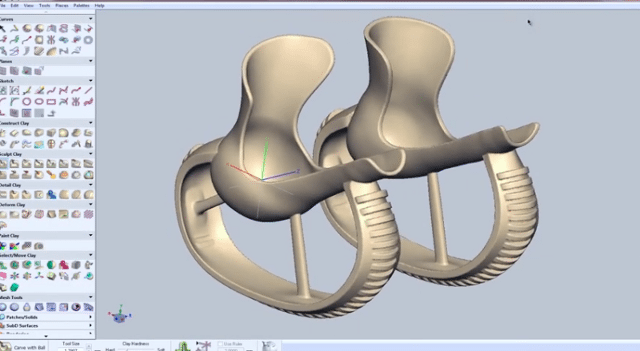 Find qualified professional animal orthotic and prosthetic designers. The first picture is similar to our dog we just adopted except it is his back legs, they are fused in a backwards position. I need the same prosthetic as in the picture for him, HOW DO I CONTACT??? Please let me know!!! I’d like to understand where you place ‘facts’ about 3d printing in this article? You quote the cost of 3d printing a prototype at $500-$700 dollars. Whomever quoted that is outrageous. I generated a 3d protoype for a fore-paw issue on a kitten, and the prototype part cost less than 50 cents & and hour of my time to generate & the animal tolerated it better than a $10 store bought brace. I’m working with licensed vetrinarians who supervise the animal’s care, and assisting in suggested design improvments. For a growing kitten, a 3d printed solution, which costs less than a dollar to print per change, (required every 3 weeks currently) its a huge improvement over major manufactured prosthetic’s. As a custom 3d printer builder & designer, i’d love to right a contrasting article with our findings of how beneficial it will be to those who want to improve the lives of their animals without enriching a single corporation. Please contact me if you are interested, I will reach out to our Vetrinarian & partner & can produce photos & medical clarifications. Mr. Kenyon, the facts came straight from Martin Kaufmann, founder of OrthoPets and veteran in animal prosthetics and orthotics for over 20 years. If you’d like to dispute them I suggest you contact him directly. You don’t cite your own experience in studying animal biomechanics, which as Mr. Kaufmann states, is critical to understanding how prosthetics can help or harm a patient. So thanks for the offer to write an article, but we’re going to decline. However if you’d like to submit an article written by a licensed professional with applied knowledge of animal biomechanics, prosthetics and orthotics, we would consider it. Thanks for the offer. You most likely do not need to get your baby a front leg, you need to consult with an orthopedic expert to determine if a prosthetic is a viable option. If your dog has already undergone a full limb amputation, it it too late. Please review the many posts about prosthetics here for much more helpful information and consider visiting a certified canine rehab vet/tech for a professional evaluation, therapy recommendations, and exercises you can do to keep your pup fit and strong. Visit a CCRT or CCRP and the Tripawds Foundation can even pay for your first visit!